Hospital culture demands that nothing is as important as the people in its care and those who serve them. So when a healthcare facility experienced elevated relative humidity levels, condensation on ductwork, and mold growth following general renovations and building additions, the building owner contacted Terracon. Our team began an evaluation of the performance of the heating, ventilating, and air conditioning system (HVAC) to determine if the system was maintaining cooling, dehumidification, relative humidity, and positive indoor air pressure per the original design. A diagnostic assessment of the building mechanical HVAC and exterior enclosure systems were conducted to determine the potential causes of elevated humidity levels and related issues. Additionally, spotted ceiling tiles and mold growth on interior walls was found in several care rooms and common areas. Our facilities experts determined that the HVAC system was operating at a negative indoor air pressure and was in need of repairs along with recalibration of the automatic controls. With help from the commissioning agent, mechanical contractor for the project, and owner’s maintenance personnel, the automatic controls of the HVAC were re-calibrated and air balanced to provide a net positive indoor air pressure in the building and to correct and maintain relative humidity levels in the acceptable performance range. The Terracon team of building specialists also provided extensive diagnostics of the building exterior to determine the pathways of moisture infiltration into the building interiors. Partial destructive investigative work was required to the building façade to observe the condition of the building exterior construction, air barriers, and sealants. The building height and limited access to the façade necessitated the expertise of our building exterior professionals trained to access the exterior façade via rope access. Architectural details for the building renovations and additions were studied to understand the designed versus installed methods of weather proofing and placement of air barriers. Extensive visual observations of the building exterior wall sections were also conducted to locate potential pathways of outside air infiltration and air movement between the outdoor environments and the indoor conditioned areas. In a further effort to investigate the potential areas of air movement between the outside environment and inside conditioned areas, and due to the urgency and target height, an infrared camera was mounted to an unmanned aircraft system (UAS) to scan the southern façades and identify variations in building surface temperatures. Scanning revealed isolated areas of the building façade that were possible areas of air movement between the outdoor ambient and indoor areas. To perform even more in-depth diagnostics, one area was selected for testing. 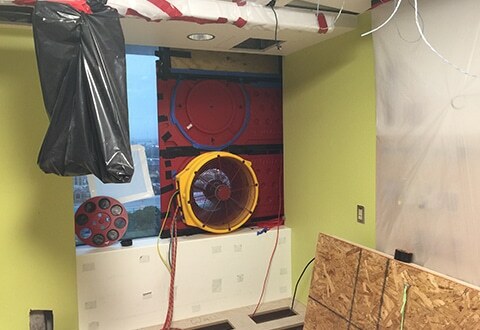 A propeller blower door fan was installed with calibrated airflow and differential pressure measurement software to accurately determine air movement through the building façade. By testing a baseline of air leakage at an indoor air pressure of approximately 0.01-inches water gauge, air movement was quantified through the selected test area for comparison to any future repairs and improvements to the façade and air barrier. Safe smoke was introduced into the ceiling plenum of the test area to trace movement of air through the façade and other pathways in the exterior wall. The results from testing indicated that careful, detailed repairs to the façade and air barrier would be needed to reduce air movement from the outside environment to the inside areas, mitigating condensation and biological growth inside the building. To develop a plan for detailed repairs to the elements of the building façade, Terracon assisted the design and contracting team in selecting fire-rated materials and sealants suitable for use in performing needed repairs that would improve the effectiveness of the air barrier and withstand typical building pressures generated by the HVAC system. Terracon performed a test of a prototype of the detailed repair for the test area and identified further areas in the façade for repairs. As the detailed repairs were being performed, Terracon provided observations and testing of the installed repairs. Terracon will also observe the ongoing operation of the mechanical HVAC system to verify that the representative,interior areas in the building are maintained at desired positive pressure and an acceptable relative humidity. This hard work has paid off, providing a safer, more comfortable environment for the facility’s occupants. Jeffery Miller, P.E. is a senior engineer and principal for Terracon in Houston. 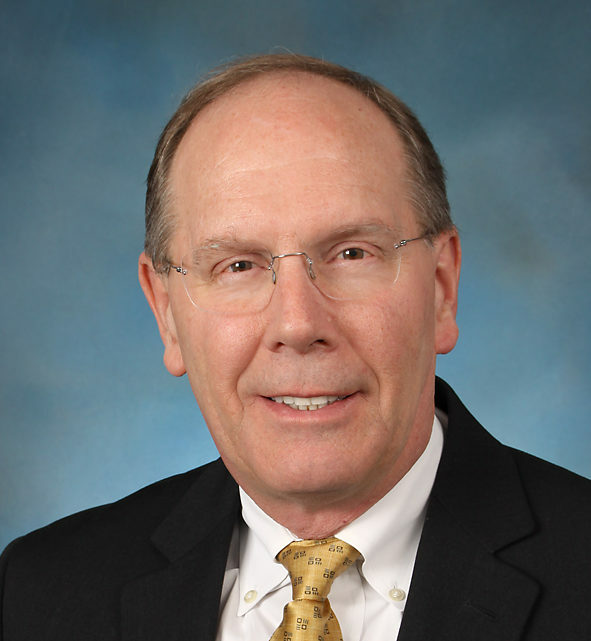 Jeffrey has more than 40 years of experience specializing in mechanical, electrical, and plumbing diagnostics, engineering, and commissioning.